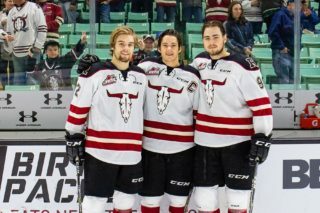 To this point , at least, it’s apparent that the Red Deer Rebels won’t be an easy out this season. Just ask the Saskatoon Blades and the Prince Albert Raiders, two of the top teams in the Eastern Conference and probably the entire Western Hockey League. 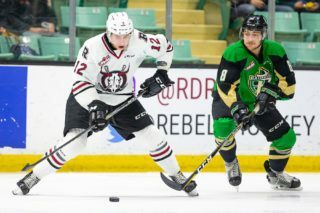 After knocking off the visiting Blades 5-4 Tuesday, the Rebels gutted out a 4-3 win — their fifth in succession — over the previously undefeated Raiders before 4,035 vastly-entertained fans Saturday at the Centrium. Captain Reese Johnson scored the winner on a highlight-reel effort with 2:16 remaining after the visitors had rallied to tie the score with two goals in a 15-second span approaching the midway point of the final period. Johnson skated over the Prince Albert blueline, stepped around a defenceman and put a wide deke on goaltender Ian Scott. 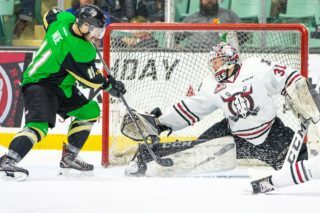 The Raiders showed why they came into the contest with a 7-0-0-0 record, directing 52 shots at Rebels netminder Ethan Anders, who was deservedly selected as first star of the game. 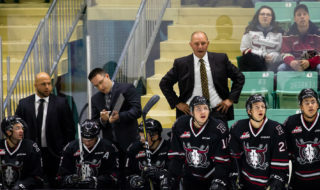 “You have to win ugly sometimes,” said Rebels GM/head coach Brent Sutter. “They (Raiders) obviously have a very good hockey team, they’re an older team. “But our young team battled and we found a way. I don’t know another way to put it. We had some good shifts, we had some bad shifts, we had some shifts that were hit and miss. The Rebels snapped a 1-1 tie with two goals less than four minutes apart early in the third period. Arshdeep Bains beat Scott with a low shot from the left circle 41 seconds in and Chris Douglas cashed his own rebound at 4:01, following a point shot by Hunter Donohoe that bounced off the end boards. But the Raiders stormed back with goals from Sergei Sapego at 8:03, following an unlucky turnover in the Rebels end, and Brett Leason, who, wired a shot past a screened Anders at 8:18. The Raiders opened the scoring with a mere 12 seconds left in the first period, as Aliaksel Protas knocked a bouncing puck past Anders , who had the puck deflect off his glove. Brandon Hagel pulled the Rebels early in the second period when he went hard to the net and deflected a two-on-one pass from Jeff de Wit past Scott, setting the stage for a sizzling third period. Another positive for the Rebels was the fact they received scoring from three lines. “We need scoring from every line and I think every line played well and worked hard tonight,” said Johnson. Perhaps the hardest worker on the ice was Anders, who was here, there and everywhere while making 49 saves, including 21 in the third period. His diving second-period stop on Noah Gregor during the game’s only power play was nothing short of sensational. Scott turned aside 19 shots for the Raiders, his best save being an outright gem on Oleg Zaytsev in the first period. Notable: Leason was named second star of the game and Johnson took third-star honours . . . With Scott on the bench in favour of an extra attacker, the Raiders found the back of the net a split second after the final buzzer sounded. It was waved off following a short discussion by the referees . . . Douglas picked up an assist to go with his goal and linemate Austin Schellenberg contributed a pair of helpers . . . The 5-2-0-0 Rebels are idle until next week when they visit the Blades and Raiders Friday and Saturday. 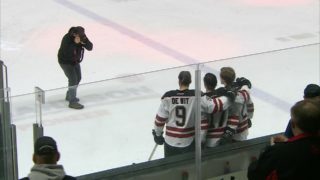 Red Deer’s next home game is Oct. 20 versus the Kootenay Ice.